We are an authorized distributor of beautifully designed Bone China Crockery - Malabar Range that are made following the latest market trends and are able to cater to the diverse requirements of the clients. 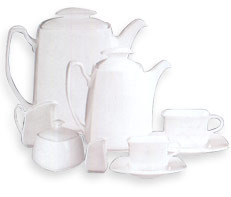 We are the manufacturer and supplier of wide array of Crockery Sets. To meet the diverse requirements of customers, we offer these products in various designs and sizes. We are offering a wide range of Banquet Range of Bone China Crockery to our clients. These crockeries are made up of premium quality raw material which is bought by the reliable vendors. Bone China Crockery available in branded and non-branded in all standard industry sizes and specifications. Can be customised to aircraft colours and branding. Also available in New Bone China, stoneware and melamine. White Bharat Bonechina Urmi Full Plate 10", Size: 10"
Backed by our rich industry experience, we offer Bone China Crockery. This bone china crockery has received words of praise from our clients since these are equipped with premium quality components which are sourced from our renowned vendors. This crockery has dazzling lusture which enhances its quality and prolongs its life. Godskitchen’s Basic Round Bowl is a must needed piece in every home and restaurant. It goes very well with any kind of existing crockery as well. 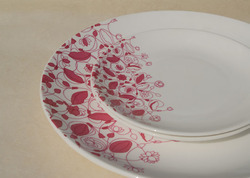 - Sizes: 6" and 6.75"
We are offering a wide range of Bone China crockery.